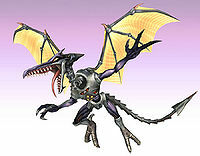 Official artwork of Meta Ridley from Metroid Prime. Meta Ridley (メタリドリー, Meta Ridley) is Ridley rebuilt and reborn through Space Pirate technology. He is far more fierce and powerful than his original version. 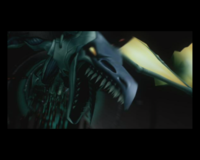 Meta Ridley first appeared in Metroid Prime. After being badly wounded by Samus in Metroid, Ridley was revived by the Space Pirates using cybernetic technology. He was equipped with additional weapons, including a mouth beam, missiles and energy bombs. Samus first sees him while trying to escape the Frigate Orpheon. She quickly pursues him in her ship to the world of Tallon IV, but loses him. She briefly sees him in the Phendrana Drifts, but their final confrontation comes when Samus attempts to access the Impact Crater. Meta Ridley's weak points are his mouth and chest. Eventually, Meta Ridley's wings burn, so he battles Samus on the ground, and is still lethally fast. Despite this, Samus defeats him. Meta Ridley returns in Metroid Prime 3: Corruption. When the Space Pirates attack Norion, Samus sees Ridley wipe out several Galactic Federation Marines. He briefly harasses her as she goes through an exposed rail while in Morph Ball form. When she goes to activate a reactor, Meta Ridley pounces her and they begin a free fall battle down the reactor shaft. Again, Meta Ridley is defeated and Samus is saved at the last minute by fellow bounty hunter Rundas. Ridley, however, still survives. When Samus goes to the Pirate Homeworld to destroy the Leviathan Seed, a large living meteor that corrupts planets with Phazon, she finds that Ridley is guarding the core. He is now enhanced by Phazon and appears as Omega Ridley. Still, he is defeated and returns to his organic form in Super Metroid. As with Ridley, many of Meta Ridley's attacks are new in Brawl; however, there are a couple attacks that are retained: In Metroid Prime, one of the attacks that Ridley uses is shooting fireballs at Samus. The fireballs that Meta Ridley shoots in Brawl are designed similarly to how they are designed in Metroid Prime. In Metroid Prime 3: Corruption, right in the middle of the fight between Samus and Ridley, Meta Ridley will grab Samus and try to perform a powerful attack. One of the attacks involves charging up a fireball and firing it at Samus. In Brawl, Meta Ridley charging and firing his fireball is very similar to how he performed it in Metroid Prime 3, except he doesn't grab onto a player while doing it. Meta Ridley's art for Brawl. Meta Ridley as he is chasing down the Falcon Flyer and gives a terrifying screech. After R.O.B., Captain Falcon, Donkey Kong, Diddy Kong, Pikachu, Samus and Olimar make their way out of the doomed Bomb Factory flying away in the Falcon Flyer, they are attacked from behind by the resurrected Meta Ridley, who is out for revenge on Samus and Pikachu. As such, he serves as the seventh boss. Meta Ridley's attacks can additionally send the Falcon Flyer reeling about. In this battle, he is attacking the ship as well and the player has 2 minutes to beat him, similar to the battle in Metroid Prime 3. He has completely different moves from Ridley and the player has to jump whenever he hits the ship or the player could fall. He is later defeated and the massive amounts of Subspace Bombs explode, covering the island in Subspace, taking everything in it, including the remains of Meta Ridley, into the Subspace. Tabuu, the leader of Subspace, revives Meta Ridley in The Great Maze to attack the heroes (oddly, Ridley and Meta Ridley each appear separately in The Great Maze), but is defeated once again, presumably leaving him dead. Trophy Stands appear frequently due to the limited time, even on easy difficulties, especially if the character is equipped with a strong Trophy Stand producing Sticker. Like all bosses Meta Ridley is controllable in Boss Battles Mode. The start button self-destructs him. Unlike any other boss however, Meta Ridley starts in a T-pose until moving, which is probably the reason he starts moving immediately when the level starts when controlled by an AI. Mega Fire Ball A or Av Meta Ridley flies from the left, then returns with his eyes glowing a fiery red. This signals that he is about to shoot a massive fireball with high KO potential. It will hit anyone on the front of the Flyer. This move is rarely used, but because of this, it can be thought of as a surprise attack. When controlled by a human he will instantly shoot the fireball without his eyes glowing. Falcon Flyer Slam A< Meta Ridley flies off the screen to the left, then attacks the Falcon Flyer, making it shake. Anyone standing on the Flyer will take damage. If a player is on the very left of the stage, there is a chance that Meta Ridley's attack will instantly KO them off the bottom blast line. It's best to jump as Meta Ridley flies away to evade the attack. When controlled by a human, he can only use this attack once. Swoop A> Meta Ridley roars, and then quickly swoops over the Falcon Flyer. Again, jumping proves the best defense. When controlled by a human, he won't roar. Tail Sweep Unusable Meta Ridley flies off the screen to the left, then sweeps low with his tail. Rapid Fire Shot Unusable Meta Ridley flies off the screen to the left, roars, and then shoots multiple fireballs. The fireballs can be reflected easily, and characters with reflecting abilities can literally jump up to Meta Ridley's face and bounce several fireballs at him, inflicting heavy damage. Other characters will have to sidestep, air dodge, or hang off the edge of the stage to evade this attack. Falcon Flyer Pull Unusable Meta Ridley grabs the back of the Falcon Flyer and tries to drag it down, while shooting large fireballs. A strong attack, such as a reflected fireball, will shake him off. The flames from the engine also do a little damage to him. Falcon Flyer Smash Unusable Meta Ridley flies up off screen, then drops and lands on the Falcon Flyer, causing it to move off the bottom of the screen. The player must jump when he uses this or they will be KO'd at the bottom. Air dodging during the jump is also recommended, as Meta Ridley can occasionally KO via the top blast line when contact is made with him as he charges down. Note that Meta Ridley can be knocked off of the Falcon Flyer if he is hit by a move with enough knockback. Like all bosses in Brawl, Meta Ridley gains an additional ×0.6 damage resistance modifier when fought in co-op mode, effectively gaining 67% more health. This modifier is applied whenever the second player is in-game, and is no longer applied if the second player loses all their stocks. Meta Ridley slams the Falcon Flyer downwards. Meta Ridley rushes past the Falcon Flyer. Meta Ridley grinds his tail along the Falcon Flyer. Meta Ridley spits multiple small fireballs. Meta Ridley, while clutching onto the Falcon Flyer and dragging it downwards, breathes out a large fireball. Meta Ridley drops onto the Falcon Flyer, cauing it to briefly plummet offscreen. Meta Ridley prepares to release a very large fireball. Meta Ridley releases the very large fireball towards the Falcon Flyer. The Meta Ridley trophy in Brawl. 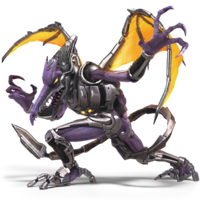 The meta form of Ridley, revived using the Space Pirates' genetic engineering and cybernetic technologies. His thin chest plate--and weak point--is protected by a highly resistant membrane. Meta Ridley is highly mobile and features a multimissile system, a bomb launcher, and powerful wings. Ice attacks are particularly effective in dealing damage to him. 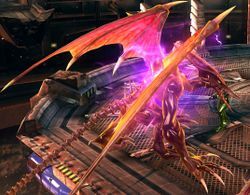 Ridley appears as the Pyrosphere's stage boss. After taking enough damage, he increases his strength by absorbing energy from the generators underneath the main platform on either side, consequently darkening his skin and giving off a purple glow. His appearance in this form is taken from Metroid: Other M when he renders himself invulnerable to Samus's Plasma Beam. In SSB4, this change merely increases his strength. The 50-Fact Extravaganza gives this form the name "Meta Ridley", although this usage of the name has no basis in the Metroid games. This is actually an alteration made by the English translation of the video; in the Japanese version, this form of Ridley is named 黒リドリー, which is more accurately translated as Black Ridley. Meta Ridley as he appears in Super Smash Bros. Ultimate. Meta Ridley briefly appears during Ridley's reveal trailer, and is a alternate costume for Ridley. Meta Ridley also has a white and green palette swap as a reference to Ridley Robot, the final boss of Metroid Zero Mission. Meta Ridley is considered to be very difficult to turn into a trophy, mostly because of the time constraints during the fight and, because he is in the air, a Trophy Stand can hit him but fall in the air by the Falcon Flyer, where the character most likely cannot get the trophy. Meta Ridley is the only boss with a time limit. Interestingly, there is no time limit for fighting Meta Ridley in The Great Maze and Boss Battles Mode. Interestingly, the music that plays during the Meta Ridley fight is Vs. Ridley, instead of Vs. Meta Ridley. Though, Vs. Meta Ridley music plays while the fighters are escaping from the factory and Vs. Meta Ridley is actually a remix of Vs. Ridley. Meta Ridley is the only boss whose HP values are not different when re-fought in The Great Maze. Meta Ridley is the only boss to become an alternate costume for a separate fighter. This page was last edited on January 6, 2019, at 23:01.